Brigham Young: FrontiersmanBrigham Young--Frontiersman is the story of the rise of the second president of The Church of Jesus Christ of Latter-day Saints (LDS), and his leadership in bringing the persecuted Church to Utah. It was the first favorable LDS major motion picture ever made, and thus it is a historically important film. It was made in 1940 (yes, it's in black and white), and like the modern LDS propaganda film The Other Side of Heaven, it was not produced by LDS. The timing here supposedly draws a reference to what the Jews were going through in Europe. But is this comparison completely warranted? Of course there is no excuse for the sort of persecution LDS received at the time, but Brigham Young--Frontiersman gives the idea that there was nothing to the hate crimes against Mormons other than the pure bias of a non-legal sort. The film paints a picture of Joseph Smith (played by Vincent Price) being arrested and put in the Carthage, Illinois jail on "trumped up charges" of treason for fighting back when his people desperately needed defending. The film fails to mention that Smith burned a printing press (The Nauvoo Expositor) for blowing the lid on his secret practice of polygamy and his teaching "a plurality of Gods above the God of this universe." So the very thing that the film portrays the LDS being persecuted for, viz., not having the freedom to believe and practice as they will was actually something that the Mormons enacted on those who printed The Nauvoo Expositor. It is also evident that the film attempts to gain more sympathy for Smith by having him not fight back when the mob raided the Carthage jail. Smith in fact shot back at the mob and actually killed two (History of the Church 6:XLI, 617-8, and 7:100-3). This was certainly justifiable, but by no means was it "going like a lamb to the slaughter" as Smith prophesied (D&C 135:4). Brigham Young (played by Dean Jagger) comes out on top of the ensuing power struggle with Angus Duncan (played by Brian Donlevy), and Young begins to lead the Saints through some rather mountainous areas of the plain states. Those film shots sure looked a lot like they were already in Utah! But nonetheless, when they supposedly are on the brink of the Salt Lake Valley, the film inaccurately portrays Young with the whole group claiming, "This is the place." Actually, he was lagging behind the group, laid out with mountain fever, and didn't arrive in Salt Lake until two weeks later. 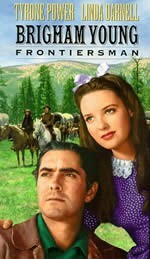 The love story between Jonathan Kent (played by Tyrone Power) and Zina Webb (played by Linda Darnell) is, well... interesting. Interesting, because LDS Jonathan falls for the non-LDS Christian Zina, and they are living together, albeit with Jonathan's mom and his considerably younger siblings. The Kents invite Zina to come with them to Zion after her father was shot and killed by an angry mob. Even after Jonathan's mom dies, Zina continues to live with Jonathan and his younger siblings. And this goes on with Young's full knowledge, and apparent approval. But then again, perhaps Young didn't approve and perhaps that's why he chooses Jonathan to go with Porter Rockwell (played by John Carradine) to send a message to the rest of the Mormons left behind all the way back in Council Bluffs. This is done not long after Young's group gets established in the Salt Lake Valley. (I actually kept expecting Young to put the moves on Zina to make her another one of his wives, but alas, it was just my imagination.) Jonathan and Zina's relationship is also interesting in that she has a big problem with him possibly one day becoming a polygamist. Right before Jonathan takes off, he proposes to her, but she snaps at him for allegedly wanting other wives as well. Then unexplainably, she kisses him, and resolves to wait for his return the next spring when she'll answer his question. I was pleasantly surprised at how Young is portrayed. He lies to the elders claiming that God spoke to him in order to get the Saints to avoid the imminent raid upon them, and to pick up and move westward to Iowa and beyond. The film did not try to conceal his plural wives. And he determines to confess to his doubting LDS following that he never received a personal revelation from the Lord. But just before Young is able to tell the people, evidently God has mercy on the starving Mormons and sends the sea gulls to eat all the crickets that are destroying their crops. This is just the type of confirmation that Young and the rest of the LDS need. Unfortunately, no one questions Young any further. For more information on this film, see here.